The Fall and Winter Months are a popular time of year for vacations and road travel. With Thanksgiving, Christmas, and New Years all bringing cold, wet, and possibly icy conditions, it’s important to plan ahead for a Safe and Happy Holidays! Keep reading our GoLaw.com BLOGS to get more Travel Safety Tips for your travels during this holiday season. • Watch weather reports prior to a long-distance drive or before driving in isolated areas. Delay trips when especially bad weather is expected. If you must leave, let others know your route, destination and estimated time of arrival. • Always make sure your vehicle is in peak operating condition by having it inspected by a AAA Approved Auto Repair facility. • Keep at least half a tank of gasoline in your vehicle at all times. • Pack a cellular telephone with your local AAA’s telephone number, plus blankets, gloves, hats, food, water and any needed medication in your vehicle. • If you become snow-bound, stay with your vehicle. It provides temporary shelter and makes it easier for rescuers to locate you. Don’t try to walk in a severe storm. It’s easy to lose sight of your vehicle in blowing snow and become lost. • Don’t over exert yourself if you try to push or dig your vehicle out of the snow. • Tie a brightly colored cloth to the antenna or place a cloth at the top of a rolled up window to signal distress. At night, keep the dome light on if possible. It only uses a small amount of electricity and will make it easier for rescuers to find you. • Make sure the exhaust pipe isn’t clogged with snow, ice or mud. A blocked exhaust could cause deadly carbon monoxide gas to leak into the passenger compartment with the engine running. • Use whatever is available to insulate your body from the cold. This could include floor mats, newspapers or paper maps. • If possible run the engine and heater just long enough to remove the chill and to conserve gasoline. • Accelerate and decelerate slowly. Applying the gas slowly to accelerate is the best method for regaining traction and avoiding skids. Don’t try to get moving in a hurry. And take time to slow down for a stoplight. Remember: It takes longer to slow down on icy roads. • Drive slowly. Everything takes longer on snow-covered roads. Accelerating, stopping, turning – nothing happens as quickly as on dry pavement. Give yourself time to maneuver by driving slowly. • The normal dry pavement following distance of three to four seconds should be increased to eight to ten seconds. This increased margin of safety will provide the longer distance needed if you have to stop. • Don’t stop if you can avoid it. There’s a big difference in the amount of inertia it takes to start moving from a full stop versus how much it takes to get moving while still rolling. If you can slow down enough to keep rolling until a traffic light changes, do it. • Don’t power up hills. Applying extra gas on snow-covered roads just starts your wheels spinning. Try to get a little inertia going before you reach the hill and let that inertia carry you to the top. As you reach the crest of the hill, reduce your speed and proceed down hill as slowly as possible. • Don’t stop going up a hill. There’s nothing worse than trying to get moving up a hill on an icy road. Get some inertia going on a flat roadway before you take on the hill. • Stay home. If you really don’t have to go out, don’t. Even if you can drive well in the snow, not everyone else can. Don’t tempt fate: If you don’t have somewhere you have to be, watch the snow from indoors. If you or a member of your family or friends are involved in a motor vehicle accident–collision, or other injury producing the event caused by the WRONGFUL CONDUCT of others, call the Law offices of Mark A Doughty at 530-674-1440. 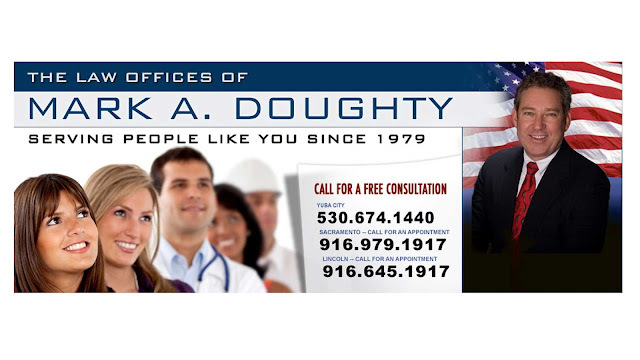 Mark A Doughty has been practicing law in California since 1979. He has served the people of Northern California and represented them without a fee unless he recovers for them (in accident cases). For more information, please see http://GoLaw.com.